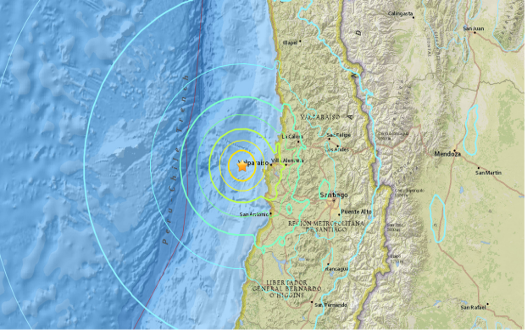 A strong 6.9-magnitude earthquake rattled central Chile on Monday, US geologists said. The quake, which struck at 6:30 pm (2130 GMT), was centered about 38 kilometers (60 miles) off the coast of the resort city of Valparaiso. It had a depth of 9.8 kilometers (six miles), according to the US Geological Survey. The USGS originally said the quake measured 7.1, but later downgraded it. Authorities urged residents to evacuate coastal areas as a precaution shortly after the quake, but cancelled the order when no large waves were generated. Meanwhile, ONEMI, Chile’s national emergency agency, said there were no immediate reports of damage or injuries. Chile lies on what is known as the “Ring of Fire”—an arc of fault lines that circles the Pacific Basin and is prone to frequent earthquakes and volcanic eruptions. The north of the country was struck by an 8.3-magnitude temblor followed by a tsunami in September 2015, killing 15 people. In 2010, a quake measuring 8.8 in magnitude was also followed by a tsunami. It struck the center and south of the country, killing more than 500 people.